Logistics routing problem is a typical NP hard problem, which is very difficult to solve accurately. On the basis of establishing logistics path optimization model, an immune clone algorithm is proposed. To improve the accuracy of search algorithms, the clonal selection and high frequency variations in the immune algorithm method are introduced. Then the antibody encoding virtual distribution point algorithm is designed to improve search efficiency. 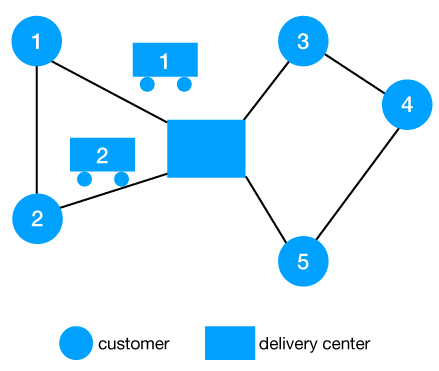 The benchmark problem of logistics delivery path optimization is simulated and analyzed. Experimental results show that the proposed immune cloning algorithm expands the range of population search and it have obvious advantages in solving large-scale complex physical distribution optimization problems. Also, the proposed algorithm can solve the optimal distribution of logistics effectively. Y. Tan, “An Improved Immune Clone Algorithm Logistics Delivery Strategy,” J. Adv. Comput. Intell. Intell. Inform., Vol.23, No.2, pp. 309-312, 2019. S. Qian and Z. Duan, “Study on Optimization Model of Logistics Distribution Routes Based on Hybrid Intelligent Algorithm,” Logistics Technology, Vol.14, No.07, pp. 357-360, 2014. M. Raap, S. Meyer-Nieberg, S. Pickl et al. “Aerial Vehicle Search-Path Optimization: A Novel Method for Emergency Operations,” J. of Optimization Theory & Applications, Vol.172, No.3, pp. 965-983, 2017. W. Liao, Z.-G. He, and Y. Qiang, “Research on delivery vehicle routing problem based on diference of customer demands,” Application Research of Computers, Vol.31, No.8, pp. 57-61, 2014. Y. Xu, L. Wang, S. Wang et al. “An effective hybrid immune algorithm for solving the distributed permutation flow-shop scheduling problem,” Engineering Optimization, Vol.46, No.9, pp. 1269-1283, 2014. P. Shen, “Quantum ant colony algorithm for optimization of logistics distribution route,” Computer Engineering and Applications, Vol.49, No.21, pp. 56-59, 2013. Y. Gajpal and P. Abad, “Saving-based Algorithms for Vehicle Routing Problem With Simultaneous Pickup and Delivery,” J. of the Operational Research Society, Vol.61, No.10, pp. 1498-1509, 2010. C. Jin and J. Yan, “Studies on improving C-W saving algorithm of the VRPSDP in supply chain logistics,” Manufacturing Automation, Vol.36, No.1 pp. 86-89, 2014. Y. Zhou, X. Sun, and W. Yu, “Research on Optimization of Logistics Distribution Route Based on Improved Genetic Algorithm,” Computer Engineering & Science, Vol.22, No.10, pp. 118-122, 2012. H. Dai, “Improved Genetic Algorithm in Multi-objective Optimization of Logistics Distribution Application,” Science Technology and Engineering, Vol.11, No.23, pp. 312-319, 2013. G. Shao and Y. Shen, “Immune Optimization for Vehichle Routing Problem of Iogistics,” Computer Measurement & Control, Vol.12, No.7, pp. 1630-1636, 2013. F. Yang, “Adaptive clone and suppression artificial immune algorithm,” Application Research of Computers, Vol.11, No.02, pp. 481-484, 2013. A. Yimit and Y. Hagihara, “2D Direction Histogram-Based Rnyi Entropic Multilevel Thresholding,” J. Adv. Comput. Intell. Intell. Inform., Vol.22, No.3, pp. 369-379, 2018.